The popular Green Wheel Relay produced its usual thrills and spills on Sunday as 47 teams and one solo runner made their way round the testing 50-mile circuit of the cycle route surrounding Peterborough. Entrants are encouraged to employ imaginative team names around a running club framework, and all participants receive a bottle of specially brewed beer at the finish, writes Barry Warne. Helpston Harriers, a self styled ‘Unofficial Unaffiliated Elite Running Club’ lived up to the ‘elite’ part of the tag as their two teams ran away with first and second place. There was just over a minute between the two Helpston squads at the finish, with their B team completing the course in 4:50.23 and the A team hot on their heels finishing in 4:51.37. The Helpston teams were balanced to make it a close race, and the dye was cast when Aaron Scott running for the eventual winners was fastest on the opening leg - an 8.3 mile route from the Embankment to Eye - in a time of 42:11 while his rival Josh Lunn went round in 43:31. 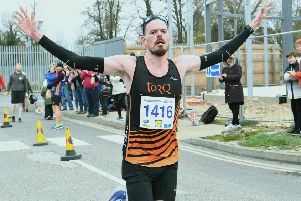 Victory for the B team was confirmed on the final leg as former Nene Valley star Chris Wright, running for the B team, held off a fast closing Ben Heron. Third place went to ‘Roses Roadrunners’ a mixed team from Fenland AC who finished in 5:53.59. There were other local winners with ‘ Yaxley Cool Runnings’ winning the senior ladies trophy in a time of 7:01.29 with Gina Crane running both the second and thirrd legs, a total of 11.75 miles from Eye to Etton in 1:30.24. Jordan Foster did her best to rescue the hapless Nene Valley team ‘The Ham Lane Mincers’ by completing the final 5.70 mile leg from Stanground to the Embankment in 36:12. Sadly her fine run failed to restore pride for a team whose runners twice got lost en route. Lee Whitton of Eye Community Runners chose to run the whole circuit as a one man team, which he did in a little over eight hours. With ultra-marathons gaining in popularity around the country the organisers are considering including this as an option in future years as the event continues to grow. Shepherd’s wife Ruth Jones was a winner at the Macclesfield Sheep Dog Trials on Saturday. The Nene Valley Harrier was unusually eager to accompany husband Brian to the event once she discovered that one of the highlights of the day was a race up and down a local fell. Despite being more used to racing on flat lands around Peterborough, the 38 year-old took the 1,700 foot ascent of the 7.3 mile Teggs Nose Fell Race course in her stride, comfortably coming home as first lady.